Pantone, the color authority, deemed Greenery its 2017 color of the year. 1. Maison sofa, by Lillian August for Hickory White, available at KDR Designer Showrooms. 2. Stirling chair, available at Design & Detail. 3. Ensemble vase, green, available at Ethan Allen. 4. Malfa wallpaper, by Manuel Canovas, available at KDR Designer Showrooms. 5. Greenery tray, available at Amini’s. 6. Phalaenopsis spray, available at Z Gallerie. One of nature’s first clues that Spring is here, the color green evokes life into our worlds. Pantone, the color authority, deemed Greenery its 2017 color of the year. 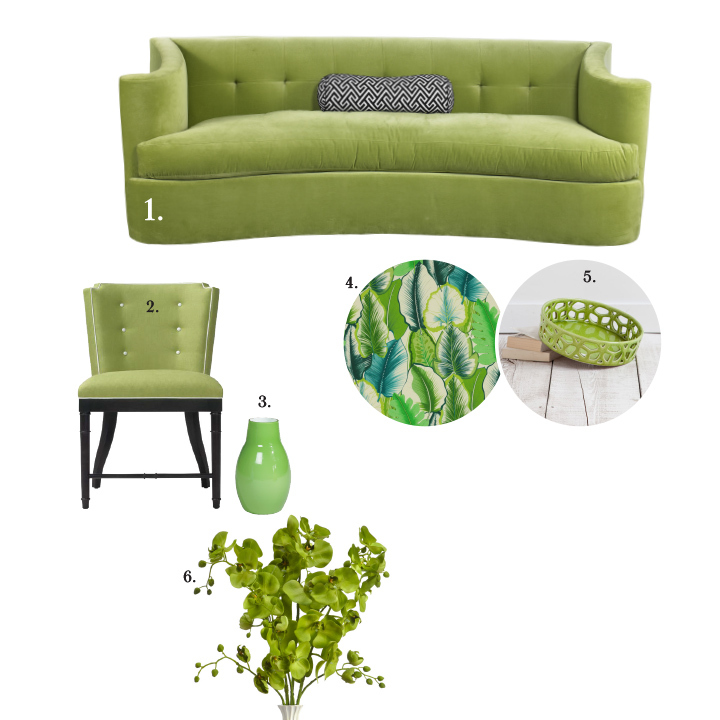 Symbolic of new beginnings, Greenery is a fresh and zesty yellow-green shade that is nature’s neutral. Bring a touch of nature into your home by incorporating pops of Greenery for a breath of fresh air. 1. Maison sofa, by Lillian August for Hickory White, available at KDR Designer Showrooms. 2. Stirling chair, available at Design & Detail. 3. Ensemble vase, green, available at Ethan Allen. 4. Malfa wallpaper, by Manuel Canovas, available at KDR Designer Showrooms. 5. Greenery tray, available at Amini’s. 6. Phalaenopsis spray, available at Z Gallerie.